Anaheim Fire & Rescue offers a Paramedic Membership Program designed to minimize the financial impact of emergency medical response in Anaheim. For less than 10 cents a day or $36 annually, enrolling in this program will decrease the costs related to a 9-1-1 medical call to your home or business. In the event of a medical emergency, if assistance is provided by Anaheim Fire & Rescue paramedics, the patient or any applicable insurance company will be charged $350 per response. With the Paramedic Membership Program, that cost is eliminated. 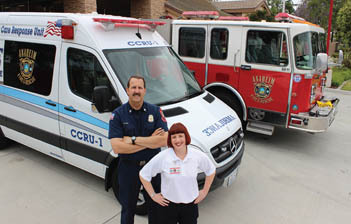 With a Residential membership, homeowners are covered for emergency medical response costs for every member of their household, anywhere in the City of Anaheim, 24 hours a day. A Residential membership also includes visitors at the residence. With a Business membership, emergency medical response costs are covered for business owners and their employees while at work. Business customers are covered if they have a Residential membership. If transport by ambulance to a hospital’s emergency department is needed, the patient or their insurance would be billed by the ambulance company. The Paramedic Membership Program eliminates only the fee for the on-site medical response provided by Anaheim Fire & Rescue. Residents and business owners can enroll in the program by email, phone, or mail. They may also go paperless by adding the Paramedic Membership Program to their Anaheim Public Utilities bill. To learn more and enroll in the program, visit www.anaheim.net/fire or call (714) 765-4060.